As the name suggests, it’s a sweet dish but not a regular pudding. 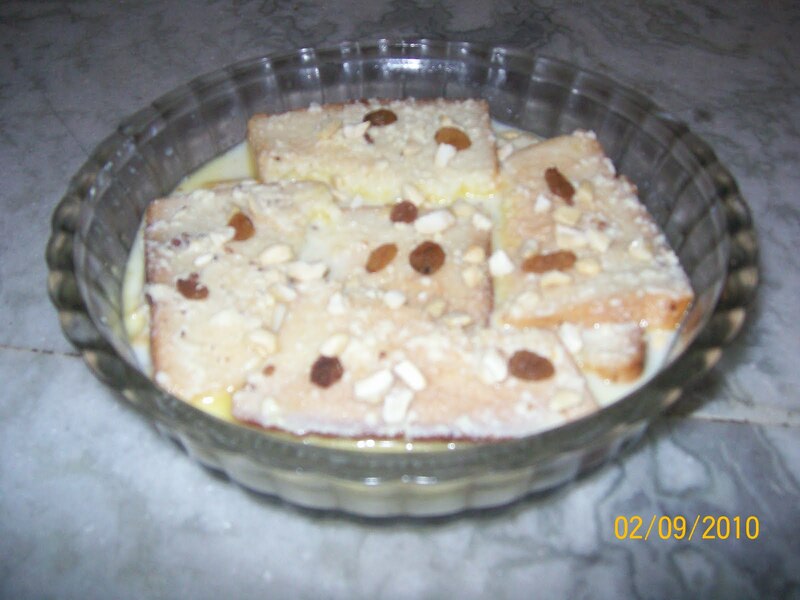 I just love this dessert – to eat and to prepare. Just try once, I am sure you will repeat. I came across with the recipe in one of the websites (don’t remember the name) and since I am a big sweet lover decided to prepare it out at home. Take 100gms sugar and elaichi and grind it to powder in a mixer. Grill the bread slices in microwave or using a toaster. The bread slices should be crispy. Take khova in a bowl and mix with water to make a moderate suspension. Just make sure it should not be too thick or too thin. Now take the milk into a cooking bowl and heat it near to boiling. When near boiling, add the khova mixture and sugar powder. Boil it in medium flame with continuous stirring till it thickens a little bit. Try not to make it too thick as the bread will absorb it. Break the bread slices into pieces and take it in a glass bowl. Pour the thickened milk over the bread slices so that it immerses in it. If you like you can garnish with kaju and resins. After it cools a bit, keep it in fridge.